TNT’s new Southern crime-themed dramedy, Claws, premiered this past Sunday night featuring a talented and diverse cast made up of Niecy Nash, Judy Reyes, Carrie Preston, Jenn Lyon, and Karrueche Tran. The group play five manicurists who work at a nail salon in a Florida strip mall. Desna, Nash’s character, is something of a den mother to her employees at the salon. She dreams of moving her crew to a nicer spot, so she participates in a money laundering scheme with her younger mafia boy toy. When Desna doesn’t get the cash she was promised, she decides to take matters into her own hands. Trying to navigate her way in a crime world that is normally dominated by men won’t be easy, but with the other women by her side, it will sure be fun to watch. “At the end of the (first) season, there’s a major power shift from patriarchal to matriarchal,” show creator Eliot Laurence said in an interview with the Tamba Bay Times. Mmhmm, as it should be. 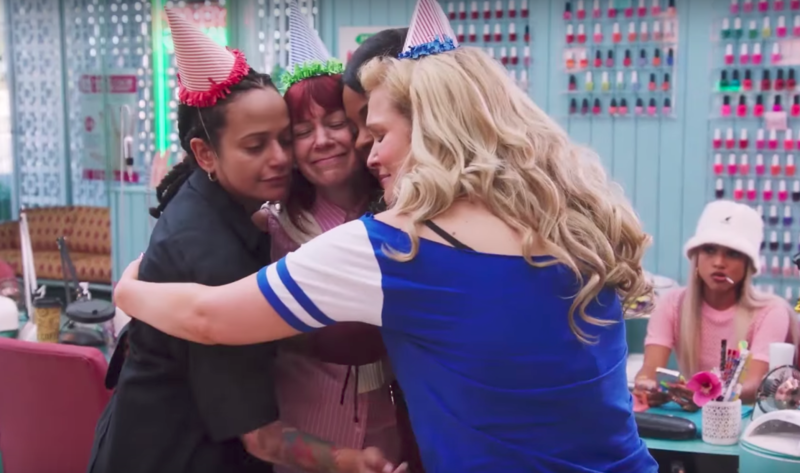 Claws is for those of us who found family in a group of complex femmes, for any woman who was tired of getting toyed with and decided to do something about it, and of course, for anyone who can appreciate the artistic precision of a really fierce manicure. This is truly the show we NEED right about now. On the set of Claws, we asked the cast about the show’s feminist themes and why they are important — especially today. While the women are all very different, they share a common bond. Family can be what — and who — you make of it. Sisterhood is about power in numbers. There’s nothing like having the right group of women by your side to lift you up when you most need it. Each character is going through their own journey, but they aren’t perfect. They make mistakes. It’s something we can all relate to. "I like that the women are making their own choices. They're surviving, but they're scrappy. They make bad choices too. It's not like they're just heroes. They're extraordinarily flawed people. — Jenn Lyon"
You can catch Claws on Sundays on TNT at 9 p.m.